Volunteering for a local charity gives you a chance to help by giving your time and expertise. You can give more than just time; you can help them to raise essential extra funds by organising a Charity Fundraising Calendar. We produce thousands of calendars each year. Not just calendars for schools and we can print a Charity Fundraising Calendar for you too. All of our templates can be customised to your requirements and we can create a bespoke front cover for your Charity Fundraising Calendar. Once your calendars are sold you can donate all of the profits to your charity. You can buy an off the peg calendar design, where all the images on the calendar are stock photographs and the only way you can customise your calendar is by adding your charity logo and charity details. However why would you do that when you could create a more personalised calendar with glorious full colour images of your charity and charitable work. 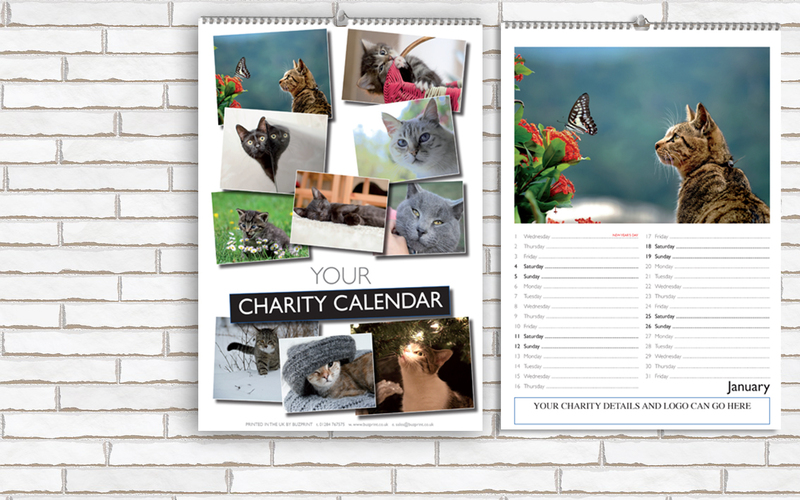 Creating your individual Charity Fundraising Calendar doesn’t have to cost any money, you could take all the images. If you don’t feel confident enough to take photographs you can ask other members of the charity for suitable photographs for inclusion in your calendar. Large or small charities can all financially benefit from producing a bespoke colour calendar. Whatever size of Charity you are looking to raise money for we can help you to hit your fundraising target. Are you looking to make money for a cat charity? Do you run a charity for rescue cats and looking to raise funds? Why don’t you create a calendar full of colourful and fun images of the cats that you have rehomed or cats you are looking to find new homes for? Take a selection of images and then create a montage that can be included in your calendar. The possibilities are endless. If you are feeling brave and able to find willing volunteers who are prepared to take their clothes off to help your charity you might want to consider creating a naked charity calendar. The Naked Charity Calendar has become popular after the famous Calendar Girls had hugh success with their Charity Calendar. You will need to find willing volunteers to pose for the camera. Creating this type of calendar can create an enormous buzz and in turn will produce free advertising and drum up interest in your local community and this in turn will increase sales. Choose a clean design like our calendar template design C, this is a great design that can easily turned into your charity fundraising calendar. Call or email us today and we can help you to start to make money for your chosen charity.